Matthew A. (Matt) Piazza- of Woburn, in Florida, March 23rd. Beloved son of Charles N. “Chuck” Piazza, his wife Debbi of Tewksbury and the late Cecilia A. (Ligorano) Piazza. Loving brother of Daniel C. Piazza of Woburn and stepbrother of Charlene Nadeau of Wakefield. Cherished nephew of Marie Greenhill of Stoneham, Jeannie Piazza-Zuniga, her husband Marlon of Miami, FL, Bob McManus of Fitchburg, Jim Joyce, his wife Kay of Tewksbury, Bill Joyce, his wife Tracey of Salem, NH and John Joyce of Lunenburg. Also survived by many cousins and countless friends. His funeral will be held from the Lynch-Cantillon Funeral Home, 263 Main Street, Woburn on Saturday, March 30th at 9 a.m. followed by a Funeral Mass in St. Charles Church, 280 Main St., Woburn, at 10 a.m. Interment in Oak Grove Cemetery, Medford. Relatives and friends are respectfully invited to call at the Funeral Home, Friday, March 29th from 4-8 p.m. At the family’s request, remembrances may be made in Matt’s memory to Justin’s Voice PO BOX 561, 2 Abbott St., Woburn MA, 01801. For directions or to leave an online condolence, please visit www.lynch-cantillon.com or Facebook under Lynch-Cantillon Funeral Home. Matthew A. 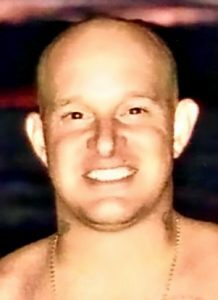 (Matt) Piazza, 37, of West Palm Beach, FL, formerly of Woburn, died of an accidental overdose on Friday, March 23rd, following a long, hard battle with addiction. Matthew was born in Boston and raised in Woburn, son of Charles N. “Chuck” Piazza, his wife Debbi of Tewksbury and the late Cecilia A. (Ligorano) Piazza. He attended Woburn High School and Austin Preparatory School, where he excelled in both Hockey and Soccer. He then continued his education at Le Cordon Bleu College of Culinary Arts in Cambridge. Matt was a talented and artistic soul with a ridiculous work ethic. For the last few years, Matt was a working partner of Fat Enzo, a screen printing and T-shirt company based in West Palm Beach, FL. In Florida, is where Matthew seemed to flourish. He made great new relationships but was also able to rejuvenate old ones. For two years, it appeared the battle was won and the vibrant, stubborn, funny, and outgoing son, brother and friend was back. Matt loved movies, music and dogs, especially his beloved dog, Tank. Matt made a lasting impact on his family and friends and his memory will never be forgotten. Matt is survived by his father, Charles N. “Chuck” Piazza, his wife Debbi of Tewksbury. Loving brother of Daniel C. Piazza of Woburn and stepbrother of Charlene Nadeau of Wakefield. Cherished nephew of Marie Greenhill of Stoneham, Jeannie Piazza-Zuniga, her husband Marlon of Miami, FL, Bob McManus of Fitchburg, Jim Joyce, his wife Kay of Tewksbury, Bill Joyce, his wife Tracey of Salem, NH and John Joyce of Lunenburg. His best friends, Bobby and Ricky Piccirillo, and Peter “the butler”, all of Florida. Also survived by many cousins and countless friends. A Funeral Mass will be held in St. Charles Church, 280 Main Street, Woburn, Saturday, March 30th at 10 a.m. Interment in Oak Grove Cemetery, Medford. Relatives and friends are respectfully invited to call at the Lynch-Cantillon Funeral Home, 263 Main Street, Woburn, Friday, March 29th from 4-8 p.m. At the family’s request, remembrances may be made in Matt’s memory to Justin’s Voice PO BOX 561, 2 Abbott St., Woburn MA, 01801. For directions or to leave an online condolence, please visit www.lynch-cantillon.com or Facebook under Lynch-Cantillon Funeral Home. His funeral will be held from the Lynch-Cantillon Funeral Home, 263 Main Street, Woburn on Saturday, March 30th at 9 a.m. followed by a Funeral Mass in St. Charles Church, 280 Main St., Woburn, at 10 a.m. Interment in Oak Grove Cemetery, Medford. Relatives and friends are respectfully invited to call at the Funeral Home, Friday, March 29th from 4-8 p.m. At the family’s request, remembrances may be made in Matt’s memory to Justin’s Voice PO BOX 561, 2 Abbott St., Woburn MA, 01801. For directions or to leave an online condolence, please visit www.lynch-cantillon.com or Facebook under Lynch-Cantillon Funeral Home. Words are simply inadequate. Matt was a family member of our Day Circle crew growing up and I loved him dearly. He was a brother to my children and a cherished friend to Ricky. My heart is pained and my soul weeps with yours. He will be forever loved – and forever missed. The world was better with him in it. So sorry to hear of Matt’s passing. Matt was always ready to provide us with a good belly laugh. I remember one day he was over our house and he mentioned that his Mom just made him pastina and egg soup. I said, “umm, that sounds delicious, what’s in it.” He looked at me very seriously and said, “pastina and egg.” We couldn’t stop laughing then or now just thinking about it. Matt also had great artistic skills. He could put a pencil to paper and draw away. It doesn’t surprise us that he worked at a company called Fat Enzo that shows you his artistic comedy. Seems like yesterday when we were watching Matt and John playing for the Bronco’s. No parent should have to go through losing a child. So sorry to hear of Matt’s passing. Gone way too soon. Joel and I remember him fondly as a child growing up on Sheridan Street. I’ll always think of that sweet little boy with a bright smile and big heart. Our sincere condolences to the family. RIP Matt. You will be missed. From a very early age, Matt was always one of my surrogate older brothers alongside Valenti, Desimone, Mercer, and Connors. He was always there to crack a joke or sling a well-timed insult and have us all in stitches, from street hockey and pool parties on Day Circle to expertly cutting classes at WMHS. I’ll never forget him begging my mother to tattoo his parents’ initials on his neck in the darkness of ‘the other side of the basement’. We thought he was insane, considering she had only tattooed on herself and a few oranges up until that point! One memory I will forever hold dear is Christmas 2017, when Matt and Danny hung out with myself and my siblings all day. We reminisced and laughed until our sides hurt, and it sincerely filled my heart with joy to finally see him truly happy and thriving. He is finally reunited with his beautiful mother, and although the pain is still raw, I am personally comforted knowing I’ve got another amazing angel looking over me. All my love to sweet Chuck and Danny and all those who loved him. Heaven must be one helluva party. Piazza, you were a beautiful soul – respectful, caring, funny – an all around joy to be around! You will be greatly missed! Rest In Peace, brother! Piazza, you were one of Johns friends that was like my little brother. You loved my family and we all loved you. I’m so sad about this news. I will never forget you letting me pierce your ear and you making Kelly and I laugh until we’d fall off the chairs. Such a good kid… and an infectious charisma. So much luv to you. Rest in peace Matt. I’ll always remember our soccer games growing up, the days at Austin Prep, and nights out with our friends. Staying out of trouble of course. You always brought a smile, or a smirk. I’m very sorry for your family’s loss. You won’t be forgotten. My wife and I want to express our deepest sympathies to the Piazza family. Matt was a dear friend of ALL my children. He loved his family and friends and was always there for them. I was delighted to hear how, years ago, Matt fought off his demons and came to Florida and made his success in business. time on this earth is just a spark compared to the eternity of our souls. I’m thankful and feel privileged to share with you at least a portion of that spark and count you as a reliable friend. I will definitely ask for you when I get there. I am so sad to hear this about Matthew. My thoughts and prayers are with the Piazza family during this most difficult time. Bro, I would love to be there with your family, thoughts and prayers to all! So very sorry for your loss. Please extend our sympathies to Dan and your family. Rest In Peace brother. You will be missed. Matt you were a great friend to me all these years from when we knew each other in AE and all the way to cooking school when we really had become great friends and how we screwed it up you ,Kolt and I lol. I’m sort of lost knowing I’m not going to talk with you like every week since you had left for Florida and I totally regret not making it down there but one thing I don’t regret is knowing that you where a true friend and all the fun times we had with the dogs swimming in your pool to training you to landscape or whatever it was it was I always will remember and I won’t ever forget. Thanks for all the laughs buddy you will be missed by everyone who had the pleasure of being your friend.Love you and we will meet again brosif. Matt, I know you’re watching from above. From the day we met, I always felt like I’d known you a lifetime. You were an open book and made me feel at ease in opening up. Every time I missed a meet you were at, I genuinely felt sorry to have missed the opportunity to hang with you. Losing you really taught me time is the only thing you never get back is time. Miss you and really wish you were here. I’m sorry I didn’t make the trip out to see you more often. As many I am at a loss for words. Matt you were definitely one of a kind with a beautiful soul who always kept us laughing. Your face book live videos were epic! You will be missed by many however the memories we all share will never be forgotten. Matt – May you finally be free, and at peace. Thinking of you Charlene, Debbi, Chucky and Danny. Love you all. Words fall short, whenever we ache with strong emotions. Matt was a constant presence in my life while I was growing up, at Day Circle, Campbell Street and beyond. His sense of humor was a treasure, his loyalty without question. He helped me during my formative years and beyond–as recently as Christmas of 2017–and would be “there” at the drop-of-a-hat if his friends needed him by their side. His “eternal summer” will never fade, not in my mind’s eye or the memory of countless others. Matty P…..I don’t have the words. You knew the deal. I love you, kid. Thanks for being you all these years. I will miss you every day. RIP my brother, catch you on the flip side.